1990 cadillac brohan 8 cylinder has no spark, is there any way i can check the coil ,I already have it out? 1990 cadillac brohan 8 cylinder has no spark, is there any way i can check the coil ,I already have it out ? 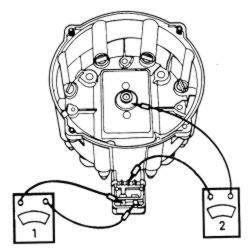 Detach the wiring connectors at the distributor cap. If necessary, label the position of each wire prior to disconnecting it. Turn the four screws and remove the cap and coil assembly from the distributor lower housing. Inspect the interior and exterior of the cap for signs of tracking. If tracking is present, replace the cap. Connect an ohmmeter across the coil terminals, which are the outermost terminals located in the recessed boss of the cap. If the reading is not at 0, or nearly 0, replace the coil. Connect the test leads of an ohmmeter to the coil center contact, located in the center of the cap. Attach the other test lead to the center terminal of the 3-wire connector, located on the cap. Make sure to set the ohmmeter to the highest setting. 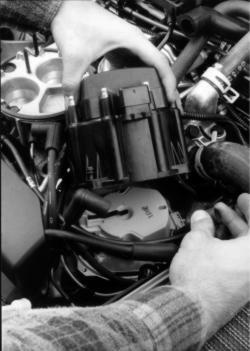 If the reading is infinite, replace the ignition coil. my coil looks nothing like that,it has 4 wire socket and were do i stick the meter too. which 8cyl engine is in yours?